Will appeal to those who like their food real spicy, be sure to make this at home, and I am sure you would make it often. It takes very little ingredients, mostly available in the kitchen. Lets get to the recipe, which makes its way to BM # 32 under Alphabet M. Mandakki is local lingo for puffed rice (or Murmura). Hope you have enjoyed the BM journey so far, and virtually savoured the menu dished out so far. And here’s also wishing all my readers from Kerala a very happy Onam and a prosperous New Year. Soak murumura in lots of water for 5 mins. Drain and squeeze out water thoroughly. In a non stick pan, heat the oil. Splutter the mustard seeds, Urad dal, curry leaves, green chillies. Add turmeric, onion and salt and peanuts. Switch off flame. 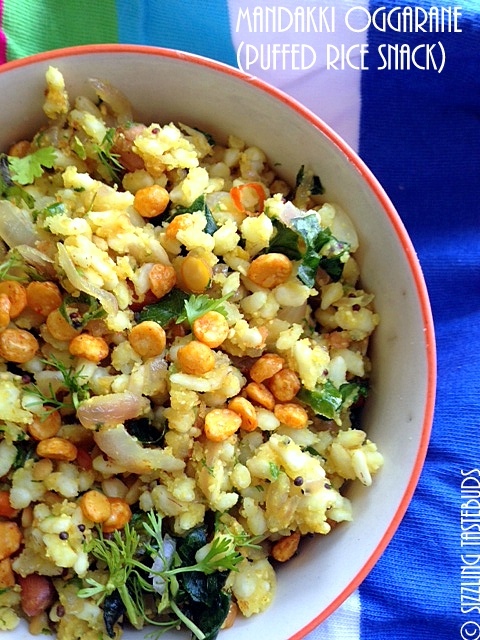 Finish with coriander, lemon juice and grated coconut. Serve immediately. I want that bowl, wat an incredible snack,makes me drool. Something like a bhel..rt?..should be interesting , looks mouthwatering. And of course new for me. instead of powdered dalia, add coarsed powder that also tastes different. Keep it up, these recipes are instant, yet tasty. Keep adding more and more recipes. That is such a delicious murmure preparation.. Looks yummy!! One of my favorite snack love to have this with a cup of coffee. Ah, this is one of the few dishes that everybody at home likes, meaning the kids love it. I made it for breakfast today..with inlaw from ananthapur, this is their weekly affair with those chili bajjis..your bowl looks so inviting.. Perfect for a cosy time in front of tv or reading a book. A favorite at home. Love this. Very tempting... bookmarking this.. looks very much like bhel!! Love the inviting bowl of uggani! I miss raichur....bringing back memories Kalyani...very tempting!! I think I commented here but I think it got lost. We call this susla and I love it.